Negotiations have failed. Mitchell was served legal papers on Friday from Spectra Energy, indicating that the company has applied to the National Energy Board for a forced entry order onto Mitchell’s cornfield, which is home to the well-known Sparkes Corn Barn. Mitchell has 21 days to respond before NEB makes a ruling. “We’re just going to ask the NEB that they leave it for us to sign a contract so that we can protect ourselves,” said Mitchell. “If the worst happens, if the order comes through, then we’re backed into a corner where we won’t have any other recourse except to stand in front of the machines. Because we have to have this (the contract). We can’t allow them to do this again,” he said, referring to land damage resulting from Spectra’s repair of the pipeline two years ago. Retired Chilliwack farmer Gord Mitchell wants oil and gas company Spectra Energy to sign an agreement before it comes back onto his land. But the Houston, Texas-based company said it has no intentions of renegotiating rights of access to the pipeline — rights, it says, it already has. The standoff originates from a 2011 incident in which the gas company accessed Mitchell’s property in rainy weather. He says the work damaged the soil and has decimated his crops every year since. “Our purpose in opposing them now is we want a very comprehsnive soil-handling contract so that if they’re not doing it properly, we can stop them,” Mitchell said in an interview with Stephen Quinn on CBC Radio One’s On the Coast. In an interview with CBC News, Spectra Energy said it compensated Mitchell with $68,000 for the loss of his crops. But the farmer said the payment amounted to only a fraction of the financial loss he suffered at the time, and did not account for future losses caused by the damage. Spectra claimed their easement in place since 1957 was sufficient. Yep, a one-time payment more than half a century ago is what Spectra is falling back on. If Spectra Energy can’t get onto land blocked by five Chilliwack farmers in the next couple weeks, the company’s natural gas pipeline replacement project will have to wait until 2014. “Ideally, we should be on the land now,” said Gary Weilinger, vice-president of Spectra, outside City Hall Tuesday. But some of those landowners were not impressed with Weilinger’s presentation on Tuesday to Chilliwack city council. “It was a joke,” said local farmer, landowner and University of the Fraser Valley agriculture professor Tom Baumann. On Dec 11, 2013 we received a preliminary draft of the Zbeetnoff Agro-Environmental Consultants Report. We learned on Dec 12, 2013 that some vital materials was omitted when Spectra Energy provided information to Zbeetnoff Consultants, regarding the Integrity Dig. ie) Photographs of Spectra Energy s machinery working in a foot of water on top of the topsoil on the Property of Greenarch Farms (1983) Ltd. (the Mitchell property.) Spectra Energy received the first draft of this report before the end of September and the report was sent back for revision 3 or 4 times. The delay is Spectra s not ours. This Preliminary Zbeetnoff Report as it stands now, without the requested addendum, is a damning report of Spectra Energy’s soil handling practises and has provided some vital information regarding egregious damage to the their soil (their environment) and the resulting remediation cost and loss of income. Spectra Energy s assertion is that our claim is only forcompensation which can be settled after the replacement project is complete. This is simplistic reasoning and purposely omits any reference to the environment. Our soil is not only our environment, it is the environment of all Canadians. This land will be passed on to future land owners to be farmed for generations producing food for this country. Damaging that environment affects all Canadians. Part of the costs involved when running a pipeline company is land acquisition and damages to private property. When the pipeline company is not forced to pay those costs then the landowner/farmer is forced to shoulder the expense. Spectra Energy prefers to call this compensation when really what we have is a transfer of money from the landowner to the Pipeline Company Shareholder. U.S. farmers don’t want to transfer their private property to a private corporation any more than Canadians do. And U.S. soil is just as much environment for all Americans as in Canada. The letter addresses Spectra’s expected claim of “irrevocable harm” if their pet pipeline project isn’t completed according to their plan. It’s not Spectra that will suffer irrevocable harm: it is the farmers there and here, and all the rest of us through whose environment Spectra wants to gouge pipelines. Right around the time corn farmer Ian Sparkes was getting ready to plant his iconic Chilliwack crop three years ago, natural gas giant Spectra Energy came on the land, dug up the soil in the rain and stayed for 35 days. Because of the long-term damage that 2011 work caused, and the company’s refusal to sign a contract to protect against future damage, property owner Gord Mitchell said he and five other farmers along Spectra’s pipeline will physically block the company from doing planned construction this spring. “If the National Energy Board (NEB) isn’t going to protect our soil then we have to protect our soil,” Mitchell told the Times Tuesday. After the 2011 incident, Mitchell and other neighbouring farmers including Tom Baumann and Alf Kloot, formed the Fraser Valley Association of Pipeline Landowners (FVAPL) to stand up to Spectra. Spectra Energy may have thousands of kilometres of natural gas pipelines across North America, but one short stretch through the heart of Chilliwack is proving to be particularly troublesome. The Fortune 500 company filed a lawsuit last Friday against six Chilliwack farmers who won’t let the pipeline company onto their properties. Because of increased population growth in Chilliwack, National Energy Board (NEB) safety guidelines require Spectra to replace a 2.4-kilometre section of 30-inch pipe. The pipeline runs beneath approximately 20 private residential and farm properties as well as the parking lots of Redline Water Sports, Superstore, Cottonwood Mall and Chilliwack Mall. The pipe also runs underneath corn fields owned by Gordon Mitchell, corn that is grown and sold by Ian Sparkes around the Fraser Valley in his iconic green and yellow corn barns. Mitchell is a defendant along with Prairie Central Road property owners Kloot Farms, Lloyd and Wendy Taekema, Susanna Gutsche, Tom and Elisabeth Baumann, and Wolfgang and Carol Ann Lambrecht. The Lambrechts, according to the lawsuit filed in Vancouver Court on May 2, have refused entry to Spectra unless a written “compensation agreement” was signed. The other five landowners formed together as the Fraser Valley Association of Pipeline Landowners (FVAPL), and have also refused Spectra access to their land. They, too, want a written agreement that Spectra will pay for crop damage. Mitchell is angry at what he says is ongoing misinformation and misleading statements from Spectra. For example, Weilinger told the Times the company has paid for crop damage to a portion of his property for the last three years since a 2011 emergency dig. The Canadian Association of Energy and Pipeline Landowner Associations (CAEPLA) posted Fraser Valley Farmers Counter Sue Spectra, with a link to the court filing of 26 May 2014. Spectra Energy started work on its pipeline maintenance project last week, as customers of the area’s grocery stores and restaurants have probably noticed. Fences were erected, equipment moved in, and workers have dug a trench across the south side of the Superstore parking lot. A company representative says the timeline is fluid and depends on how quickly the project progresses, but estimates the construction and the booth will appear on the Cottonwood side within three weeks. Could that be a tacit admission that Spectra can’t finish the pipeline without an agreement with those farmers? According to Spectra’s own Westcoast Energy Inc. web page which links to an interactive map, the farmer suit is about upgrades to an existing north-to-south pipeline that goes past Chiliwack, in the Fraser Valley, east of Vancouver. It’s the dark blue line on the extrat at the right from CEPA.com’s interactive map. 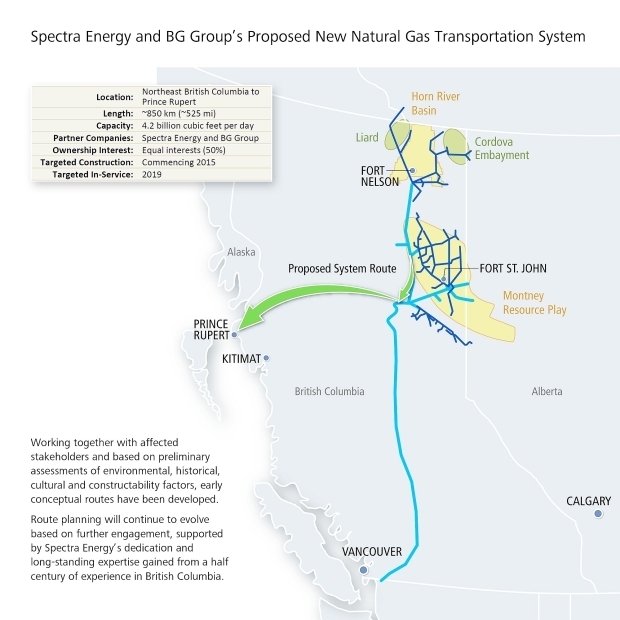 And the green arrow on that map is Spectra’s Westcoast Connector project for not one but two giant pipelines to an LNG export terminal. 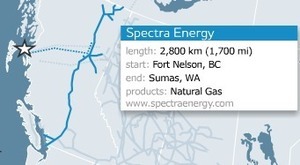 That’s actually Spectra’s main map to illustrate that export pipeline project; Spectra doesn’t seem to publish a static map for their existing north-to-south Westcoast pipeline. And his experiences sound much like local landowners’ experiences with Spectra here in the southeast. Right up to Spectra making activists out of reclusive conservative landowners. Wake up Spectra…FAIR COMPENSATION…. Whats your problem.